While Angela’s early career began in pharmaceuticals as a teenager, financial services soon called to her when she realized it was as much about client care as it was about the numbers. In particular, Angela enjoys being someone people count on to “get things done,” whatever the need. Fortunately, that’s just what we and our clients were looking for too. As our all-around administrator, Angela helps input client information into our system and ensures smooth processes for new and existing clients. She also serves as a liaison to our business partners, supports our advisory team, responds to client requests, and helps us run an organized office. 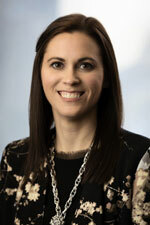 Prior to joining us at Grand Wealth, Angela was a client associate at Wells Fargo Advisors. She also has business, operations, account management and billing experience from her multi-year pharmaceutical career, and has completed college-level coursework in marketing, advertising and psychology/child development. In her free time, Angela is a devoted mom to her athletic son, cheering him on in his many sports interests, and occasionally playing hoops with him herself. Born and raised in Grand Rapids, she enjoys reading, traveling, especially to visit the youngest of her two brothers in California, spending summers at Lincoln Lake and volunteering at her son’s middle school. And, by the way, in case you were wondering, her last name is pronounced “Ace-mont” (with a silent “j”).